Beginning in 2001, the Cerasuolo di Vittoria DOCG Consortium (www.cerasuolovittoria.eu) was created to monitor and safeguard the quality of this excellent wine, as well as promote its exportation. 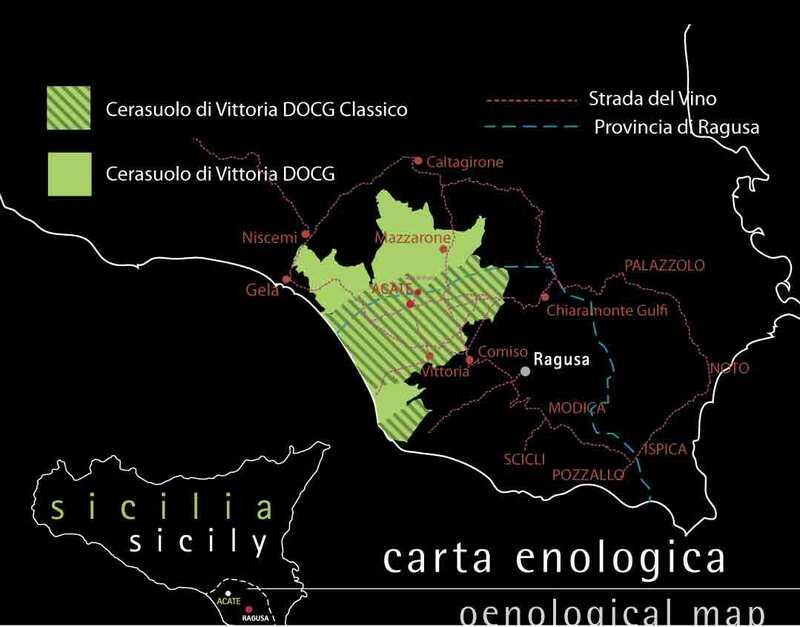 The consortium represents roughly 85% of the winemakers in Ragusa province, including Catania and Caltanissetta, which are the only areas responsible for the production of Cerasuolo di Vittoria wines. As part of its commitment to recuperate and protect the local territory, Valle dell’Acate has joined the “Le strade del vino” (Wine Routes) project, and the company cantina has become a key site on the “Cerasuolo di Vittoria, from Baroque to Liberty” route. The territory covered by the Cerasuolo di Vittoria wine route lies between Ragusa and Catania provinces, where visitors can see the first foothills of the Iblei Mountains. The soil is connected by a single common denominator: its Cerasuolo di Vittoria wine. The soil boasts broad swathes of uncontaminated properties, from hills inland to the sea, rich in Mediterranean beauty and attractions to suit the needs of any curious, careful and considerate traveler. In its diverse towns and through its various traditions, visitors to this territory can trace the accomplishments of a culture connected to the soil and its wine. In 1973, the Cerasuolo di Vittoria grape became one of the first Sicilian reds to earn DOC status, and was elevated to DOCG status on September 13, 2005. Its current typology was created in 1606, when the town of Vittoria was founded. The town’s founder, Vittoria Colonna Enriquez, bequeathed two hectares to each of the first 75 colonists, with the only condition that each colonist cultivate a vineyard. The production area for “Cerasuolo di Vittoria Classico” is limited to the territory established through an initial decree released May 29, 1973, and includes the following municipalities within the Ragusa province: Vittoria, Comiso, Acate, Chiaramonte Gulfi and Santa Croce Camerina. The DOCG wines “Cerasuolo di Vittoria” and “Cerasuolo di Vittoria Classico” must be obtained using vines in mono- or pluri-varietal cultivation that boast the following ampelography: between 50% and 70% Nero d’Avola; and 30% to 50% Frappato. DOCG Cerasuolo di Vittoria wines must be aged for at least 8 months following harvest, while the “Classico” must be aged for no less than 18 months. Furthermore, winemaking and bottling must be conducted entirely within the established production territory. The Cerasuolo di Vittoria wine route offers visitors a path rich in beauty that winds its way amid illustrious examples of Baroque architecture, as well as the only examples of Liberty architecture to be found in Sicily. The surrounding territory can boast innumerable artworks, classical ruins and traces of the many cultures that have dominated this land over millennia.